If you are a beginner, the EZ THROW MODELS are specifically designed with the novice in mind. 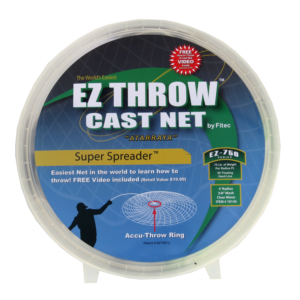 The EZ Accuthrow ring allows the net’s centrifugal force to practically throw itself. This series is a bullseye net design and comes in an optional ¾ lb. and 1lb. radius foot weight system. The EZ THROW™ Cast Net practically opens itself every time it is thrown – even by beginners! The patented ACCU-THROW RING™ is a our aluminum ring placed at the top of the cast net to displace the centrifugal force evenly forcing the net to open perfectly every time. With 1 lb. REAL LEAD per radius foot.